A fun, active and different way to get way from the crowds and explore the beautiful coastline of Turkey�s Turquoise Coast. We offer a variety of trips, listed below, suitable for beginners and for people with previous paddling experience. We start all trips with a briefing and practice session in the kayaks, to introduce you to paddling techniques and safety procedures. A picnic lunch is provided on all one-day tours, plus transport to the start/finish point where necessary. Wildlife, varied scenery and conditions.� Sea and channel. Cliffs, islands, ruined church.� Sea. Sheltered bay, boat-builders villages, ruined castles.� Sea. Islands, sheltered bays, and beaches.� Sea. "World class! We had a wonderful trip. It is the perfect way to experience Turkey and all she has to offer. From the beautiful lake and sea, the ruins, experiencing the beautiful local food, you have really put together a unique tour. Good exercise, good sightseeing, good company. The boats and tents were in excellent shape and everything went as promised. As Vedat said, he considered us his guests and he treated us like very special guests. Thank you so much, we will certainly recommend you highly. " We had an amazing time and would like to say what a fantastic trip we all thought it was and how fantastic Vedat and Engin were, they made it a trip never to be forgotten. I have been on many holidays with guides before but they are definitely the best. We were all very sad when it came to an end. Thank you for your fantastic communication with me which made it very easy to organise.
" Would be hard to go wrong with such a beautiful landscape and Sally was an amenable and responsive leader. Food preparation was excellent and of good quality�Will recommend the tour company to any others thinking of a relaxing way to be active." "The trip of kayaking was a real friendly meeting, without �tourists�, in the wild nature, Beautiful landscapes, many animals to observe, no noise, no stress." 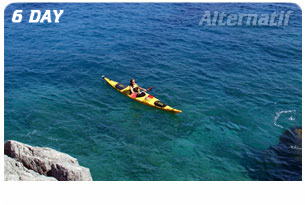 �"I just wanted to thank Alternatif Outdoor for such a great holiday. The equipment was excellent, the route worked really well and looked well researched. The level of activity was just right: challenging, but with some relaxed afternoons on the beach. We�ve had a great time, I�d recommend you to anyone." �"Really enjoyed all aspects of this holiday � great fun from start to finish. Felt very comfortable and relaxed with the excellent competence of the leaders. I was extremely impressed with the planning and running of the trip, and the culinary skills were brilliant! Thanks a million." 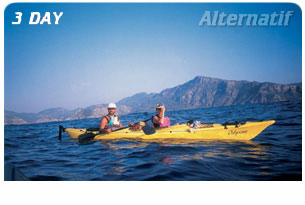 �"This was one of the most enjoyable kayaking trips we have had, made so by our guide. Everything possible was done to make sure everyone had an excellent experience." "Just a quick message to record our appreciation of your input in our 6 day paddle around Bozburun (19-26/9/09). The canoes were fine, the transport & accommodation arranged to our satisfaction & the staff all very obliging & attentive. We wish you every success." "It is a pleasure for me to forward a troughout positive feedback to our tour performed last week. There is nearly nothing to improve. As well thanks to you for unbureaucratic and reliable administration and the really nice accomodations provided at the beginning in Koycegiz and at the end in Gocek. Both very sympatic with individual and familiar atmosphere. We will treasure this trip as unforgettable." �"This was an idyllic holiday � on the first night I lay awake watching the stars and thinking too much�by the last evening I watched the stars in meditation and felt gently aware of the whispering sea, the faint breeze�at �one� with my surroundings and ready to accept the adventure was nearly over. I hope to come again on another trip and will not just recommend this holiday, but broadcast it to any passerby who will listen!"